You might have heard that the husband and I are hopeless romantics, in which case you heard wrong. We recently celebrated our 38th wedding anniversary by buying two toilets. Our house is younger than we are, but is falling apart at a far faster rate. Two of our toilets, original to the house, needed to be replaced. That giant flushing sound you heard was us being sucked into the world of plumbing. A buyer is dizzy with choices these days – round bowl or elongated, a 12-inch or 14-inch set, one-piece or two-piece and so many GPFs (gallons per flush). And then there are the names – toilets are now like fingernail polish in that they have names. There’s Glacier Bay, the Cimarron, the Cadet, and the Santa Rosa. Perhaps you’d prefer the Niagara, the Elliston or the Devonshire. new ones and sped away. All was well with the Wellworths until someone attempted to use the one in the half-bath off the family room. The bathroom door would not close. The new toilet stuck out farther than the old one—not much, but enough that the door couldn’t clear the toilet. We were now the proud owners of a toilet, bolted to the floor in the most visible high-traffic area of our home, that could only be used with the door fully open. Suggestions for solving our dilemma were many. One wit suggested we remove the door and hang a shower curtain in the doorway. Another card suggested we hang hippie beads. Another proposed we cut a curve in the door to match the profile of the toilet. Another friend told us to get www.absolutedp.com in to sort it. Someone else suggested we rip apart the door frame, then rehang the door so it would swing out instead of in. I was pretty sure all we needed was a toilet one inch shorter from the front to the back. 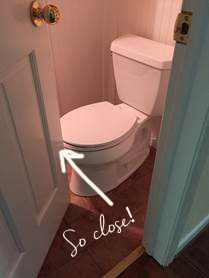 The husband questioned my math and went all engineer-y on me, drawing chalk lines on the bathroom floor tile to calculate the arc of the door closing in conjunction with the projection of the toilet. We found a toilet that is 1 and 1/8 inch shorter from a plumbing supply house online. This one goes by the name Toto. Wait ‘til you hear what we have planned for our 40th.